It is always, "Just one more thing..." around here in the mornings, or the afternoons, or evenings. Always. I marvel how we get out the door for errands and necessary appointments every morning (except, the mornings when I don't make it, of course.) This morning was no different. 2. buy and set final 4 new cedar posts for the goat pasture (Sean set 6 new posts already this week, but Pepper is still pulling the fencing down and walking out whenever the mood strikes her to do so. 7. move Ellie into new temporary kid enclosure for the week. 8. move said enclosure to opposite field with waist tall hay growing. Add to this list our regular weekly meeting attendance, time set aside for our volunteer ministry work and our family worship night, the regular feeding, watering, and mucking chores, the sad and necessary burial of 2 hens which died from natural causes (one yesterday and one today), dropping Meg & Kristen to visit their Dad for dinner 2 nights this week (after picking them up from a sleepover with their older sister this morning) and you have the makings of a triumphant accomplishment or impending disaster! I guess you'll have to stay tuned to see what happens. By the time Sean left for work and I drove the hour to my eldest daughter's home, we had already cleaned and medicated a fish tank, finished the gosling/duckling enclosure, milked Ellie, filtered the milk, and sanitized the equipment, fed and watered all the critters, and moved the chicks to their new home. After work, Sean brought the girls to their Dad for dinner and returned to work in the back garden. With the use of a weed whacker, a hammer (to remove a rusted fence from last year) and our hand-pulling the weeds, Sean and I readied the bed for its tomatoes. Our day was not all work. 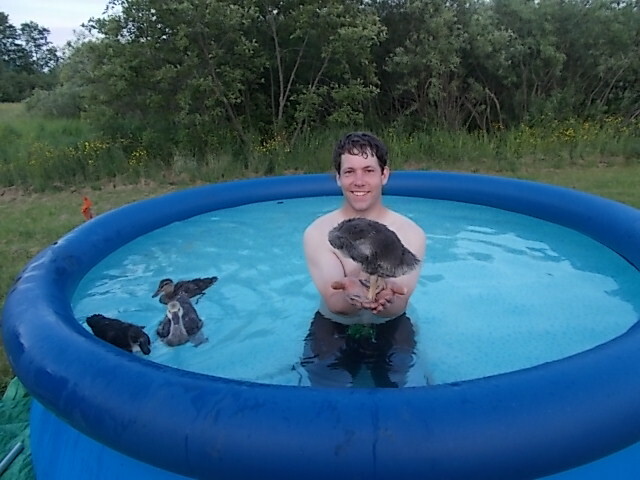 We took a few minutes to swim with the goslings and ducklings in a pool. We want them to be well-trained and obedient so that they will be able to go with us to a local lake to enjoy swimming with our family. The goslings are so tame. They swim for a bit, using their necks to pour water down their backs and preening. When they get tired of that, they love to climb on my hand to rest. It is late and time for bed, finally. I am worried about how my babies are going to handle their first night outside. A silly notion to most people, probably- they are water fowl- but these particular birds have become very dear to my heart. I know that I am not going to be able to sleep peacefully tonight despite Sean's reassurances. Wow, the goslings and ducklings are getting so big! I am happy they are still sweet and tame. I hope you get everything done. Can't wait to see you guys!! !